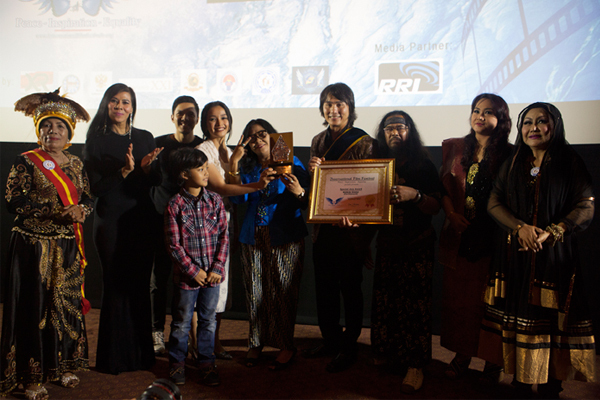 Robin Shou, Hollywood Actor known for his role as Liu Kang in Mortal Kombat came to Indonesia to attend the world premiere of his movie as a director, Earthbound, in International Film Festival For Peace, Inspiration and Equality (IFFPIE). Robin Shou is also a professional stuntman and trainer for Milla Jovovich in Resident Evil, he also stars in Holllywood movies like (Death Race, Street Fighter: The Legend of Chun-Li, Beverly Hills Ninja, TV series; Cold Case, etc). Earthbound is a short film that tells a story about the victims of Indian ocean tsunami in 2004 in Aceh, Indonesia. This film received International Special Jury Award from this international festival that is held in Jakarta. Earthbound stars includes famous Indonesian actor and actress such as; Tya Arifin, Reza Nangin, Bima Azriel and Teuku Rifnu Wikana. Besides that, IFFPIE also gives the award of Man of Inspiration 2015 to the former U.S. President; Jimmy Carter. This award was also given to the Indonesia President Jokowi last year as Man of Inspiration 2014. IFFPIE also gives Special Jury Award to Oscar nominee, Andy Garcia (The Godfather Part III) and Alice Krige (Star Trek, Thor). Damien Dematra as the founder and director of IFFPIE says that he is so happy to give this awards to them because it shows that until now there is still a lot of people who would like to promote peace and inspiration through creative ways. "The existence of this international festivals will be the examples for young generations to keep on going without giving up peace and humanity.” said Natasha Dematra as peace and humanity ambassador.